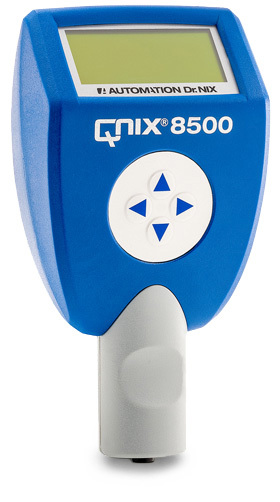 The QNix 8500 allows you to accurately measure coating thickness on iron and steel substrates as well as non-magnetic metal substrates, such as aluminum, zinc, copper, brass and stainless steel. The gauge features a modular system with interchangeable probes. In addition, you will benefit from bi-directional wireless communication with your PC, multiple calibration options and a configurable language setting. Whether implementing a quality control management program, inspecting an outdoor structure, or using them on a liquid or powder line, this gauge will improve your job performance. 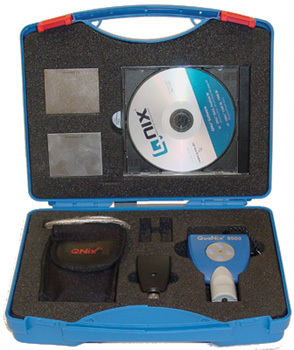 Picture on left is shown with Optional Software package. With the one-point or two-point calibration the accuracy can still be improved using the optionally available test shims. Wireless Probes must remain plugged into Gage for approx. 5 hours to fully charge.